Topped with bleu cheese dressing, Nueske’s applewood smoked bacon, chopped egg and Roma tomatoes. East Asian shishito peppers pan-sautéed with soy, garlic and red chili. Fresh cauliflower florets buttermilk-battered and fried to a golden brown, the tossed in housemade Sriracha buffalo sauce and topped with a salad of celery, cilantro, scallions and Gorgonzola. Shaved Parmesan and housemade garlic butter croutons. Our super-grain salad with asparagus, sun-dried tomatoes, red onions, toasted pine nuts and Feta tossed in our housemade Champagne vinaigrette. Warm artichoke hearts, asparagus, eggplant, red & yellow peppers, corn and sun-dried tomatoes, served over cool Romaine with avocado and housemade Dijon balsamic vinaigrette. Marinated grilled chicken breast with pan roasted vegetables and our housemade Argentinean inspired chimichurri sauce. Sesame-crusted Ahi tuna steak and seared baby bok choy, over a stir-fry of roasted faro, Shiitake mushrooms and sweet chili. Topped with pickled ginger. Our lighter spin on a traditional recipe. Zucchini ribbons sautéed with lemon, garlic and white wine, tossed with parsley, Parmesan and a touch of fettuccine. Rolled pasta noodles with pan-sautéed Cremini, Portobello and seasonal mushrooms, Parmesan and fresh thyme & parsley. Fusilli in a light creamy cheese sauce. Grilled steak, fire roasted mild chilies, onions, cilantro pesto, Monterey Jack and Mozzarella cheeses. Served with a side of tomatillo salsa. Nueske’s applewood smoked bacon, roasted chicken and Mozzarella, hearth-baked then topped with avocado, wild arugula, fresh torn basil and Romaine tossed in lemon-pepper mayo. Italian Sausage, pepperoni, applewood smoked ham, spicy Capicola ham and salami. Spicy sweet Caribbean sauce, authentic Jamaican spices, Nueske’s applewood smoked bacon, red onions and bell peppers. Oven-roasted artichoke hearts, roasted garlic, sautéed spinach, Mozzarella and Parmesan. Additional nutritional information is available upon request in our nutritional guide. Crisp Romaine, Roma tomatoes, garbanzos, Feta, black olives and red onions with our mustard herb vinaigrette. Past the front desk. Straight through the casino. 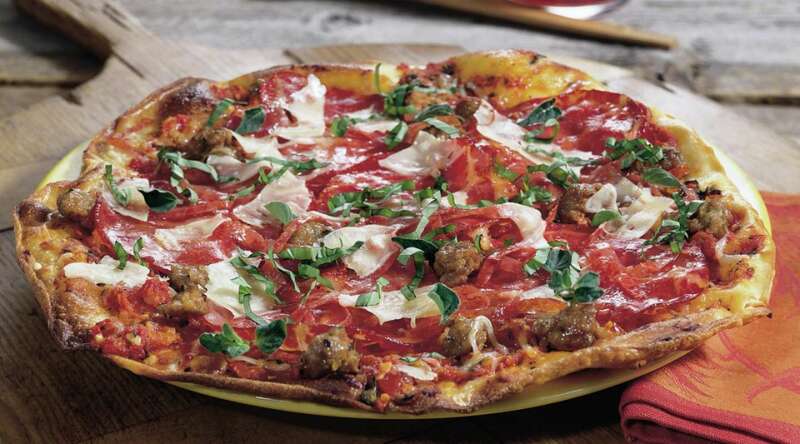 California Pizza Kitchen will be on your left hand side. Right out of the elevators. Follow the walkway alongside M life Desk. When out front of the LOVE Theatre, follow the walkway to the left. Turn right on the walkway at the Craps tables. 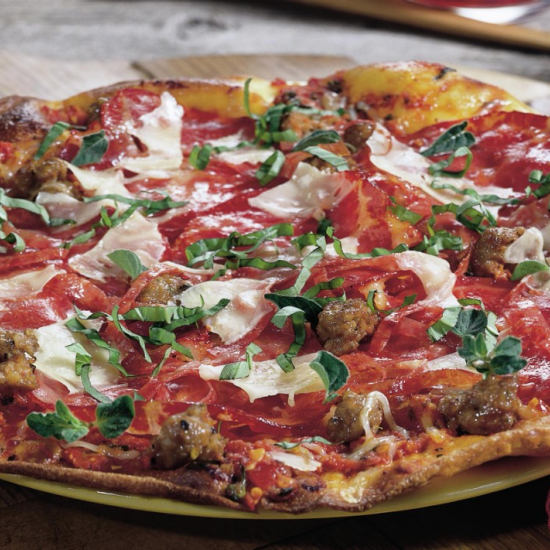 California Pizza Kitchen will be on your right hand side. Turn left before the atrium. Follow the walkway straight through the casino. California Pizza Kitchen will be on your left hand side. Guest must be at least 21 years old to dine at the bar counter.